With the Pro Breeze Electric Mini Dehumidifier, you can stop living or working in an environment that has excess moisture and mold. The compact size makes this dehumidifier the perfect choice for small offices, bathrooms, bedrooms, garages, and other spaces of up to 150 square feet, including boats and cars with 110-volt outlets. Smaller capacity dehumidifiers are suitable for those who need to save space, or to use it in smaller rooms like the garage, caravan, kitchen, or bedrooms which are small in size. But do they do a satisfactory job eliminating moisture from the air? Let’s look at this Pro Breeze Electric Mini Dehumidifier review to find out. For eliminating musty odors, allergens, and excess moisture, you cannot go wrong by choosing the Pro Breeze Electric Mini Dehumidifier. Anyone with a small space of up to 150 square feet (1,200 cubic feet) that has a problem of damp air, mold, and excess moisture, benefits from this product. Because it significantly improves indoor air quality, it is also perfect for people living with allergies, asthma, and various upper respiratory conditions. With a cleaner and fresher environment, both home and work spaces become more enjoyable. When it comes to portable dehumidifiers, the Pro Breeze Electric Mini Dehumidifier is hard to beat. However, because it only covers 150 square feet (1,200 cubic feet), it may not suffice for every situation. For larger spaces, you would need to consider something a little more robust. Compact Size – Weighing only 2.4 pounds and measuring just 6 by 7 by 11 inches, you can use this miniature dehumidifier anywhere. The light weight of this unit makes it easy to move from one location to another. All you need is a standard 110-volt power outlet. 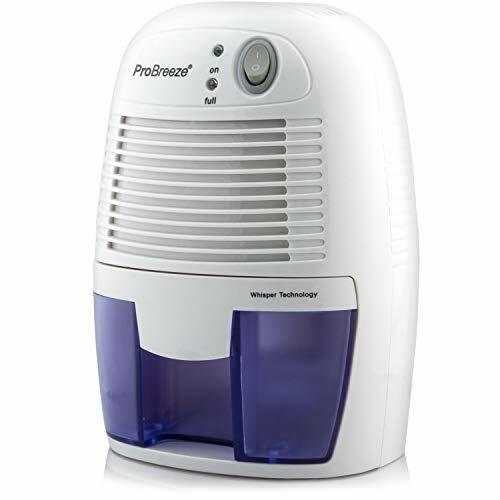 In addition to bedrooms, studies, offices, kitchens, bathrooms, and other small spaces, this miniature dehumidifier is ideal for boats and automobiles with a 110-volt power outlet. Excellent Safety – This portable dehumidifier removes up to 9 ounces of water per day and has a 16-ounce capacity water tank. It also has an automatic shut-off feature once the tank fills. Efficiency and Quietness – The Pro Breeze Electric Mini Dehumidifier boasts innovative technology known as Thermo-Electric Cooling. That means it does not require a compressor to operate. Because of that, it runs quietly, making it ideal for nurseries, home studies, and bedrooms. Optimal Operating Condition – This miniature dehumidifier is excellent for small spaces in home and work environments. However, for optimal results, you should run the dehumidifier at temperatures ranging from 59 to 86 degrees Fahrenheit (15 to 30 degrees Celsius). Also note, this portable dehumidifier does not operate at temperatures below 41 degrees Fahrenheit (5 degrees Celsius). Special Features – This dehumidifier is a portable, compact, and lightweight moisture absorber, capable of extracting as much as 9 ounces of moisture daily. Also, as an energy-efficient unit, it consumes little power to operate. As a result, it will not affect your energy bill. To use the Pro Breeze Electric Mini Dehumidifier, all you need to do is plug it in. While operating, the LED light stays illuminated. Once the 9-ounce tank fills, the unit shuts off automatically. This safety feature provides complete peace of mind if you forget to turn the unit off after leaving home or work. For small spaces of up to 150 square feet (1,200 cubic feet), you would have a tough time finding another dehumidifier that matches the performance of the Pro Breeze Electric Mini Dehumidifier. However, because it has limited coverage, you might need a more powerful unit in some circumstances. An excellent alternative is the 4-gallon tank hOmeLabs dehumidifier. This midsized portable dehumidifier is an excellent choice for rooms of up to 1,000 square feet. Not only does this unit have Energy Star certification, which saves you money during operation, but it also comes with built-in handles and wheels for easy portability. The Pro Breeze Electric Mini Dehumidifier offers a host of benefits. It removes allergens, like mold, mildew, and dust, to improve indoor air quality. It also has an efficient yet quiet operation, plus it works great in homes, businesses, and even cars and boats. Also very convenient thanks to its automatic shutoff for added safety. If you are looking for utility and value, the Pro Breeze Electric Mini Dehumidifier is the correct choice for you to use in a small bedroom, bathroom, garage caravan, or other small spaces. Previous Post Portable Dehumidifier by hOmeLabs Review Next Post How many Dehumidifiers do I need for my House?